Organe hebdomadaire du Groupe independant des etudes esoteriques de Paris / Revue de Philosophie Esoterique / Revue Philosophique des Hautes Etudes . . . Ayant pour But: L'Etude de la Tradition Esoterique et des Divers Mouvements du Spiritualisme Ancien et Moderne. 1/1, November 12, 1890-December 1935. 4-5 fr. Four, then 8, then 16, and finally in 1914 32-64 pp. The journal was suspended for four months at the end of 1897 and beginning of 1898 and then suspended again at the end of 1898 until revived in 1905 in a second series, with new numbering. This was followed by a third series in 1910. The journal was suspended yet again during the First World War and then revived in January 1920. It was founded by Papus (Gerard Encausse) as the weekly companion of his L'Initiation, begun two years earlier, as one of the organs of his Groupe Independante d'Etudes Esoteriques (later L'Ecole Hermetique) and its Faculte des Sciences Hermetiques led by Papus and F. Ch. Barlet)-a graduate school of occultism and, more secretly, a pool from which promising young occultists could be led into the deeper mysteries concealed in the Ordre Martiniste. Initially, the journal was primarily devoted to notices and reports of meetings and lectures of the occult establishment beholden to Papus but it came over time, as occult activity fell off, to include more articles on general occult subjects. A subscription to the journal or to L'Initiation automatically entitled the reader to membership in the Groupe. Papus's idea of occult education as a sifting of masses of disparate occult books, theories and practices rather than as the interiorization of received truth-from Theosophical Mahatmas, for example-is characteristic of the man and the time and is closely tied to Papus's idea of "initiation" as only the beginning step (initium) toward knowledge. Both ideas were conceived and expounded in stark contrast to the teachings being propounded in the Theosophical Society at the time. 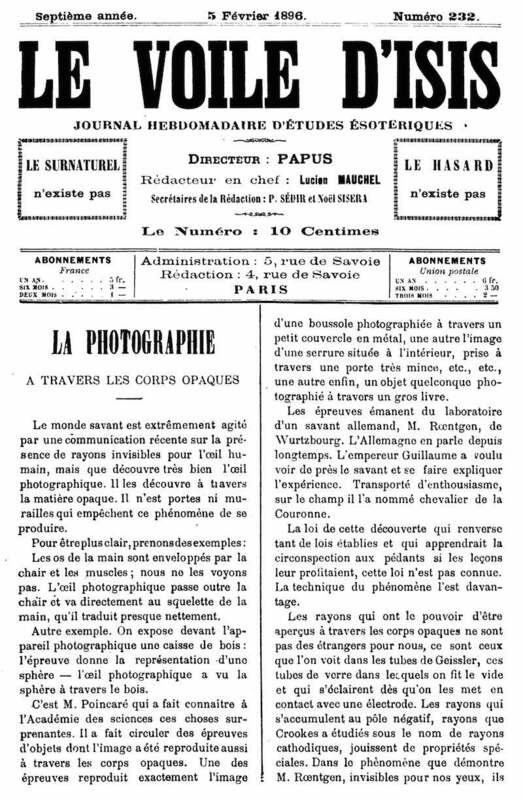 See Papus, "Qu'est-ce qu'un Initie," L'Initiation 2/3 (March 1889): 193-199. On the occult context of the journal's origin, see Joscelyn Godwin, "The Beginnings of Theosophy in France," London: Theosophical History Center, 1989. The journal advertised itself as devoted to "neo-spiritualisme," a term which included the complete range of occult interests of the time. Everyone involved in the fin-de-siecle French occult explosion published at one time or another in Voile d'Isis: "Papus" (Gérard Encausse), René Guénon, F.-Ch. Barlet, Paul Sédir, et al. The editor in the 1920s and early 1930s was Paul Redonnel, an aged symbolist poet, who in 1900 had collaborated with Jollivet-Castelot, Paul Sédir, F.-Charles Barlet, Jules Delassus, Edouard d'Hoogue, Victor-Emile Michelet, Papus, Phaneg, Mme de Thebes, and others in the famous Les Sciences Maudites. As a poet and litterateur Redonnel also published a literary review, Chimere, Revue Independente d'Insolence Littéraire (Paris, August 1891-June 1893). In 1929, René Guénon agreed to collaborate fully in the journal, but only on the condition that it gradually cease publishing the work of most of the mediocre "occultists" who had been writing for it, leaving only Grillot de Givry, Patrice Genty, Probst-Biraben, and a few others acceptable to Guenon. Georges Thomas ("Tamos") became editor in chief. Beginning in 1936, the journal became Etudes Traditionnelles and the organ of Guenon's traditionalist thought. Lists of contributors for 1920-1935 can now be found online at http://rene-guenon.org/r-isinum1.html, arranged by authors, subjects and articles. Le Voile d'Isis (November 1890). Voile d'Isis Ns V3 N26 1907 Dec.
Voile d'Isis Ns V3 N27 1908 Jan.
Voile d'Isis 3s N49 1914 Jan?